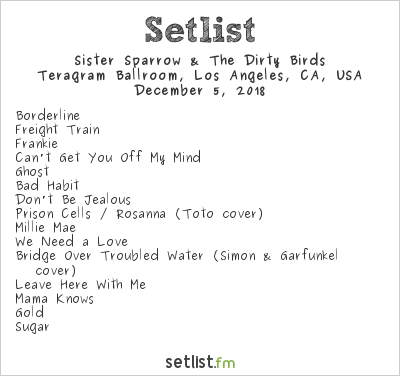 Home > Sister Sparrow & The Dirty Birds Are Gold At The Teragram Ballroom > Sister Sparrow & The Dirty Birds @ Teragram Ballroom 12/05/18. Setlist. Sister Sparrow & The Dirty Birds @ Teragram Ballroom 12/05/18. Setlist. Millennial dreamboat LANY sells out the Hollywood Palladium for career-making feat The charismatic Los Angeles-based indie-pop trio performed two sold-out nights at the Palladium, proving the future is theirs. Listen to Rob $tone’s Packed “Chill Bill” Remix The remix features D.R.A.M., Denzel Curry, and Cousin Stizz.